A quenelle is mixture of creamed fish, chicken, or meat, sometimes combined with breadcrumbs, with a light egg binding. It is usually poached. Formerly, quenelles were often used as a garnish in haute cuisine; today, they are usually served on their own. 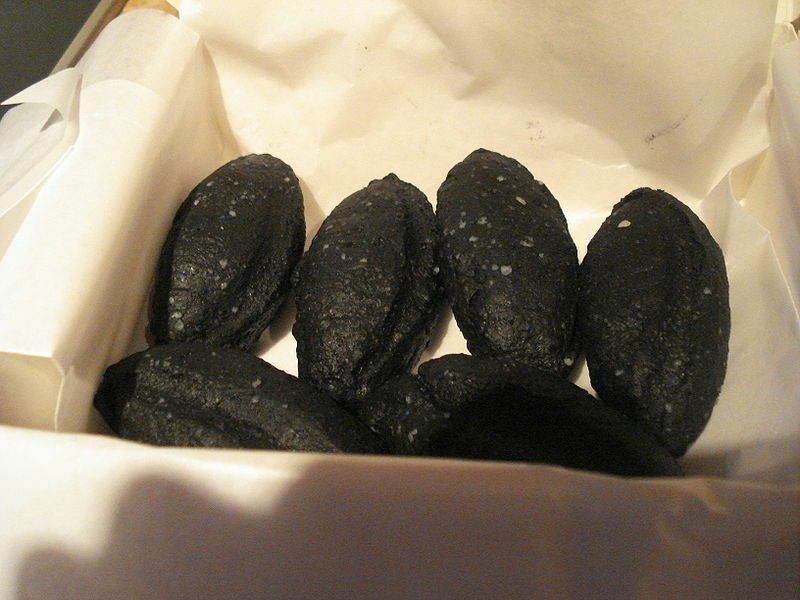 Left: Quenelle noires à l'encre de seiche - quenelles colored black with cuttlefish ink. Lyon and Nantua are famous for their quenelles de brochet (mousseline) (pike quenelles), often served with cream sauce and run under the salamander grill. Pike has many small bones, so passing it through a tamis (a type of strainer) is an expeditious way of removing them. The word quenelle is derived from the German Knödel (noodle or dumpling). There are many ways to prepare quenelles de brochet, but most recipes first prepare a panade, essentially a white sauce, then combine the panade with fish, and put the mixture through a sieve, yielding a farce. The quenelles are formed from the farce and poached. They may be served sauced and grilled, or with a variety of sauces. Quenelle may also refer to a food item made into an oval or egg shape, such as ice cream, sorbet, or mashed potato quenelles. This usage derives from the original shape of the egg-and-meat quenelle.